To configure a Cisco router to route TCP/IP packets, you need to give each interface on the router an IP address and subnet mask. 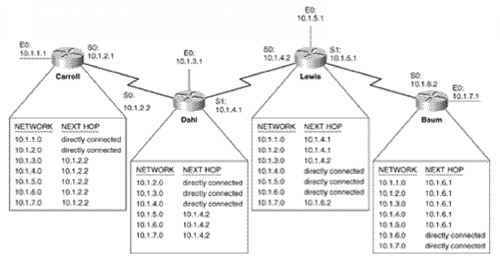 You also typically configure a dynamic routing protocol, which discovers the routes in a network. That's typically all the configuration that is required to make a Cisco router route IP packets. However, Cisco covers many details of router operation on the INTRO exam beyond just configuring a few IP addresses and an IP routing protocol. So, before you even get into the details of configuring IP on a Cisco router, you need some background information on Cisco routers—this chapter covers those details. If you support Cisco routers as part of your job, most things in this chapter will be things that you do every day. Some Cisco switches use a CLI such as Cisco IOS Software—for instance, the 1900 and 2950 series switches. This chapter covers the IOS CLI on a router, and Chapter 8, "Operating Cisco LAN Switches," covers some details of the IOS CLI on 2950 LAN switches.